Congratulations to senior Joseph Krug who qualified for the NYS Championships for the third year in Extemporaneous Speaking. Cheers also to freshman Peter Rao who has earned membership in the National Forensics League! Congratulations to seniors Patrice Legoute and Joseph Foley who have earned membership in the National Forensics League. At the Saturday’s speech tournament, sophomore Jasha Basila qualified for the NYS championships in JV Extemp for the second straight year. 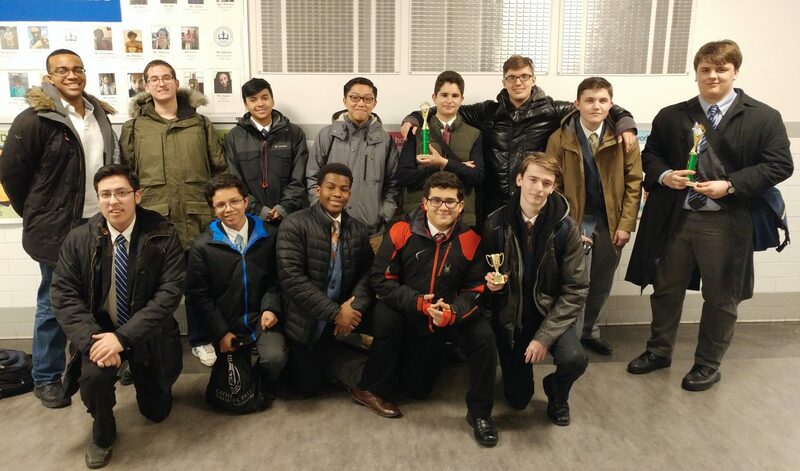 Trophies were also won by Joe Foley in Congress, Joe Krug, Mike Murphy and Rafael Silva in Varsity Extemp, and Eryk Baginski and Antonio Coyoc (the first of his career!) in JV Extemp. 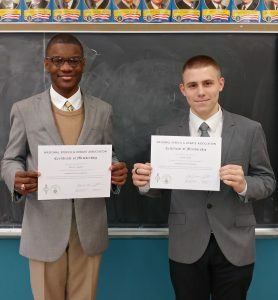 Congratulations to senior Rasheed Kelly for earning membership in the National Forensics League and to senior Joe Krug for earning a degree of Special Distinction. Freshman Peter Rao qualified for the NYS championships. Seniors Joseph Krug and Antoine Haran won trophies in Varsity Extemp and Student Congress respectively. The team is shown here celebrating with alumni judges Will Tarrant, Aiden Birth and Max Bogusz. At this Saturday’s speech tournament (snow doesn’t stop us! ), Cathedral won a 3rd place team trophy in Student Congress. Peter Rao finished 1st in Declamation and earned a half-qual for the NYS Championships. Joe Foley and Antoine Haran also earned half-quals in Student Congress. 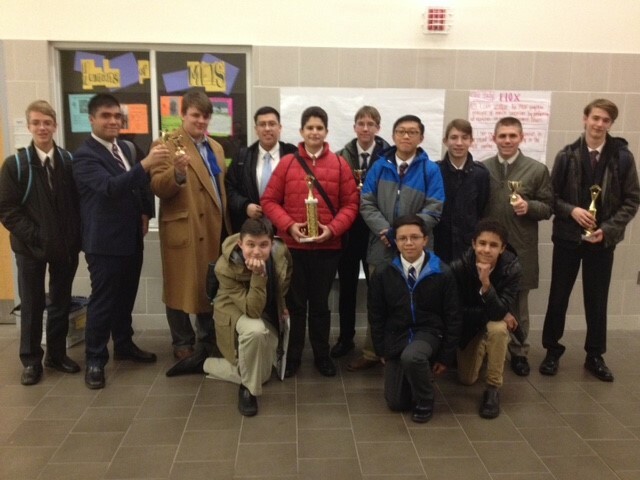 Trophies were also won by Joseph Krug in Varsity Extemp, Peter Munoz in Student Congress, and Eryk Baginski in JV Extemp. The team is pictured here after the Awards Ceremony. 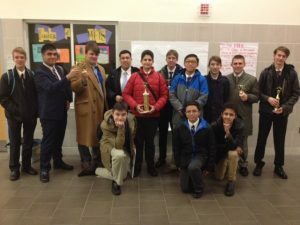 At this Saturday’s Speech competition, sophomore Eryk Baginski won a trophy in JV Extemp and freshman Peter Rao won the first trophy of his career in Declamation. Thanks to seniors Antoine Haran, Rasheed Kelly and Patrice Legoute for judging. 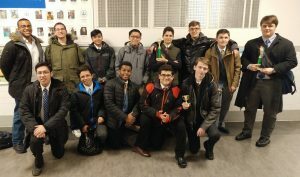 Congratulations to Freshmen Peter Rao and Antonio Coyoc who competed for the first time for Cathedral at the Forensics meet at Kellenberg H.S. In addition Junior Frank Oliva and Sophomore Jasha Basila earned their membership degrees from the National Forensics League. Thanks goes to Alumni Justin Ruiz and Michael Younan who judged for their alma mater. On Saturday. October 7th, Cathedral opened the Speech season at the Mary Louis Academy. Sophomore Jasha Basila won a trophy in J.V. 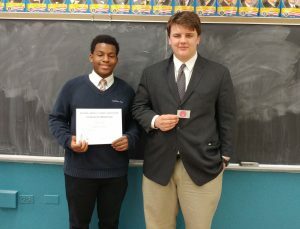 Extemp Speaking and earned a half-qualification for the NYS Championships in April. Congratulations to Sophomore Jan Bierowiec, and Freshmen Jaden Cosme, Matt Censullo and David Cotrina for competing for the first time for Cathedral.